Ah… the Samaritan woman at the well. Even those who aren’t terribly familiar with the Bible are likely to remember this story. And why not? It has an air of scandal. She has a bad reputation. The woman is somehow tainted, immoral. Five husbands? And a sixth man to whom she is not married? Jesus leaves Judea for Galilee. He has to go through Samaria. 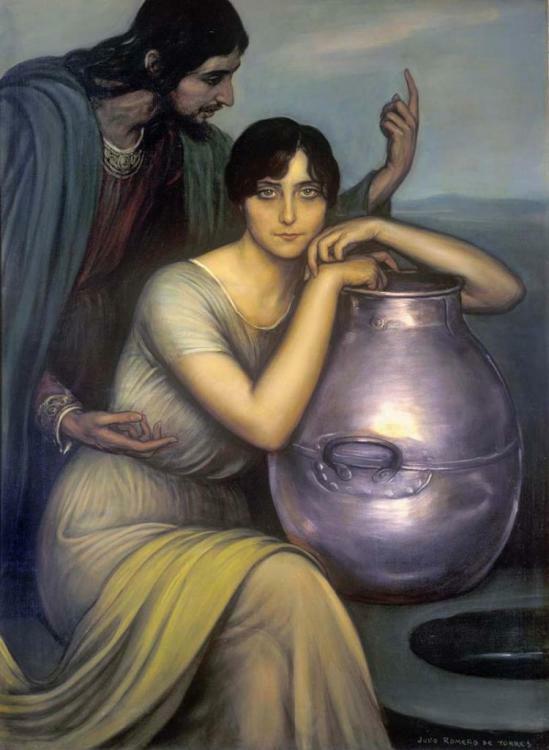 Christ and the Samaritan Woman . Romero de Torres, Julio, 1874-1930. Art courtesy of the Jean and Alexander Heard Library, Art in the Christian Tradition (ACT) database, Vanderbilt University. Jesus arrives at the well and engages the Samaritan woman in conversation. She does not know who he is. She has not heard the rumors that he is a teacher. Instead, this man is a thirsty Jew who dares to ask her directly for a drink of water. Jesus’ request crosses religious, ethnic and gender boundaries. It is problematic that he speaking to her because she is a Samaritan. Furthermore, she is not just a Samaritan but she is a woman. She is not just a woman, she is a woman of questionable reputation. Jesus breaks the rules to talk with her. The first issue is religious and cultural. She is a Samaritan; he is a Jew. The second issue is gender. She is a woman; he is a man. The third issue is her past. Biblical scholars and preachers have labeled as immoral, promiscuous, sinful, adulterous. If they are right, then Jesus is risking his own reputation by talking to her. A traditional interpretation of this text goes something like this. The woman has a shameful past. She doesn’t even merit a name in this story. She is a nobody. But Jesus talks to “the nobody.” He hints at his true identity. He confronts her with her sinfulness, as proof that he is no ordinary man. How else could he have known this? But despite her sins, he reveals to her that he is the Messiah. He prophesies that the “hour is coming” when true worshippers will worship the Father in spirit and truth. Because of what he has said to her, because he knows “everything she has ever done,” many other Samaritans approach Jesus. He preaches there for two days and many come to believe he is the Savior. In this version of the story, she is a literary device and serves a specific purpose. She is a one-dimensional character to whom Jesus can make his astonishing claims. The focus in this interpretation is on what Jesus says and does. What she says and does is secondary. This is a story about Jesus breaking boundaries – Jesus loving the sinner – Jesus including the outsiders. A good story. And this is a perfectly acceptable interpretation. But for it to work, she must be type-cast as a “bad” woman. Now, Lent is a particularly appropriate season to re-examine traditional interpretations. To look inside the text and see if there is another message. I’d like to re-cast this woman at the well. I’d like to remove the stigma of immorality. I’d like to suggest another interpretation. The woman at the well deserves, not our derision, but our compassion. This woman at the well also deserves our admiration. The woman at the well was a marginalized person. She was subject to economic, legal and social exploitation. As a Samaritan, she was considered unclean and impure by the Jews. Can you imagine being told your whole life that everything you touch becomes unclean? Her marital history set her apart, even within her own culture. Maybe the woman at the well wasn’t promiscuous at all. Could it be that she married five times for economic reasons? She lived in a society in which women had no social or legal standing apart from a man – a father, a brother, a son or a husband. Having a man to support her may have been her only means of survival. Biblical scholar Gail O’Day says that in first century Palestine culture, a woman had very little control over her own life – marriage and divorce were the prerogative of men. We don’t know why she had married five times. Had her five husbands died? Had they divorced her, perhaps for something beyond her control like the inability to have children? Divorce or widowed, either way her life was difficult. She was an object of pity. In this view, Jesus knows that the Samaritan woman is among the most vulnerable of her society. Jesus is not judging the woman for her sinfulness. Suppose, instead, that Jesus brings up the issue of her five husbands because he accurately describes her life situation in which she is marginalized. Suppose, then, that Jesus is not only revealing his supernatural knowledge, but he is expressing compassion and concern for the suffering and hardships she has endured. The woman at the well sits on the lowest rungs of social status. Yet, the Gospel reading also shows that she is a strong woman worthy of our admiration. She is intellectually astute. Her conversation with Jesus is one of the longest recorded in the Gospels. She engages Jesus in theological debate about worship. She accurately recognizes that Jesus is more than a thirsty Jewish traveler, he might be a prophet. He might even be the Messiah. She is courageous. Imagine Jesus, as a white man, approaching an African American woman at a segregated water fountain in the 1950s American South. The Samaritan woman’s conversation is no less courageous. She dares to speak frankly with Jesus. In verse 12, she challenges Jesus’ authority over and against her ancestor Jacob. She is able to ask Jesus for the living water which he offers. But most remarkable of all is her faith. She expresses a genuine interest in being in a proper relationship with God. It is significant that she leaves her water jar. Her need for physical water is secondary at this moment. She has something far more important to think about. She has news to share. She drops her water jar much like Peter and Andrew leave behind their nets when they are called become disciples. What has just happened? Has Jesus just invited her to become a disciple to the Samaritans? The reaction of the townspeople is interesting. They respond immediately to her news. Her townspeople believe on account of her words. She becomes an apostle proclaiming the good news long before the disciples do. The woman at the well truly is a missionary. She is a laborer to harvest the crop to which Jesus speaks metaphorically. This alternative view of the woman at the well has been explored by feminist theologians including Barbara Essex who wrote a book series called “Bad Girls of the Bible.” Of course, we can’t prove this alternative interpretation but neither can we prove the traditional view that labels the woman at the well as promiscuous. Now why is this different interpretation important? Lent is an appropriate time to reflect on scripture and see if we can connect to it in new ways. Here; I invite you to insert yourself into the story of Jesus and the woman at the well. Can you see yourself as Jesus in this story? Are you willing to go to the places where the others are? Are you willing to break social rules and talk to those people you aren’t supposed to? Brenda Salter McNeil has written a wonderful book on reconciliation across gender, racial and social lines. It’s called “A Credible Witness” and the entire book is comprised of reflections based on the woman at the well. McNeil challenges us to go, like Jesus, to go places like Samaria. To experience the “otherness,” to witness the complexity of differences, to offer reconciliation. Can you see yourself as the woman at the well? As I look around this room I see girls and women. Putting a positive spin on her gender changes how we see ourselves in the story of faith. Yes, the woman at the well is marginalized within her culture, but she is also strong, intelligent and decisive. She becomes the first apostle to the Samaritans. This is particularly remarkable because she is a foreign woman with a questionable past. And yet, her importance to the story of faith needs to be recovered and celebrated. The woman at the well represents not just women, but anyone who has been made to feel invisible. We need to be honest about our culture and how we marginalize particular groups of people. By marginalized, I mean pushing people to the margins of our culture. Lowering their status. Stigmatizing them. Denying them full inclusion in our society. This story reminds us how very easy it us for us to discover the whole person, to realize their full worth. We do what Jesus did. He simply sat down and talked to her in a real and meaningful way. It is so much harder to push people to the margins once we are in relationship with them. Women and girls continued to be marginalized in our society. People of color continue to be marginalized forty-seven years after the Civil Rights Act. Members of the LGBT community are marginalized. Those among us who are unemployed are marginalized. Those with physical and mental disabilities are marginalized. Those who have been incarcerated are marginalized. They become invisible to us. They have little value to us. And even if you don’t find that you fit into obvious categories, I dare say that all of us at one time may feel marginalized, made to feel less than our full value — for reasons of our education, our economic status, because of where we come from, where we live, our age, some aspect of who we are. As a girl I was raised in a church that did not allow women on the altar. Women could not read the lessons, they could not hold a chalice. They could not take one step up onto the red carpeted chancel. We would somehow taint what was sacred. I don’t have adequate words to describe how painful that message is to a young girl. As I have grown into middle age, I have realized how invisible I have become. So many people don’t even bother to engage in conversation with me because they assume that I have nothing interesting to say. The woman at the well is my hero. And I am grateful to Jesus for taking the time to talk with her. Re-interpreting the story of the woman at the well reminds us that no matter what our status in society is, we are not powerless. Each of us has the power to respond to the gospel as remarkably as the woman at the well. By recovering the positive aspects of her story we honor the extraordinary person that she was. Day, Janeth N. The Woman at the Well: Interpretation of John 4:1-42 in Retrospect and Prospect. Leiden: Brill, 2002. Essex, Barbara J. More Bad Girls of the Bible. Cleveland: Pilgrim Press, 2009. McNeil, Brenda S. A Credible Witness: Reflections on Power, Evangelism and Race. Downers Grove, Ill: IVP Books, 2008. This was lovely. I started pastoral ministry in the hospital for Wayne Co. WV. Country WVirginians are simple folk, sometimes rough, most often respectful of clergy. To have a genuine conversation required exactly what you have described, a quiet openness to the other, a recognition of their person. Sharon Welch says that solidarity is built in acts of recognition. I would not be surprised if the woman at the well became an apostle, regardless of her past.